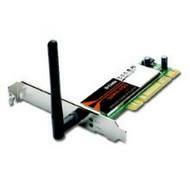 D-LINK DWA-525, DESKTOP WIRELESS N 150 PCI ADAPTER is a draft 802.11n, Up to 4 times farther than 802.11g. Support 802.11g and 802.11b wireless networks. Ad-hoc and Infrastructure operation modes. WEP, WPA, WAP2 encryption support.